Avatar continued its rampage through the North American Box Office, logging a record setting $50.3M on this, its 4th weekend, in the process toppling Titanic from the “All-time 4th Weekend” perch at $28m, bringing its US total to $430.8m, tops for any 2009 release and moving into 7th place all-time. It’s global total now stands at $1.341.7B, second only to Titanic’s now seemingly attainable $1.84B, after pulling in a record $40m first week total from China. Again, as it has in all previous weekends, Avatar exceeded expectations which were set in the low to mid $40m range. (Yours truly had boldly projected $53m; this is the first time Avatar has fallen short of my projections — but $50.3m on the 4th weekend, with a drop of only 26% when most were projecting a 40% drop, is still extraordinary–and Avatar again had to be upgraded from its original Sunday morning estimate of $48.5 to a Monday afternoon actual of $50.3M) Avatar remains on track to pass Titanic in mid-February, probably on Valentine’s Day weekend. 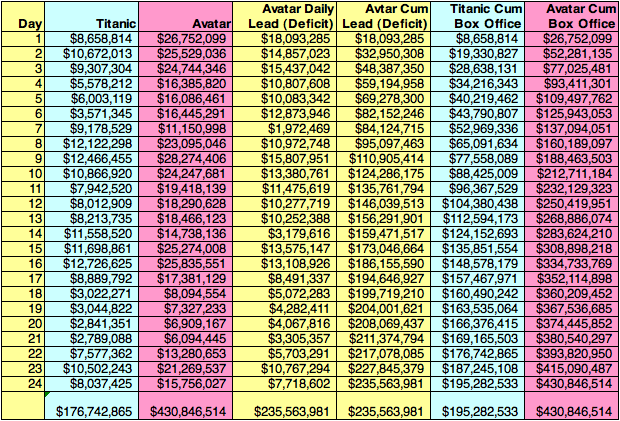 Here is the Avatar vs Titanic ‘same number of days in release’ chart, updated to reflect this weekend’s results.